The mantra “trust the process” is often used by AFLW coach Scott Gowans. 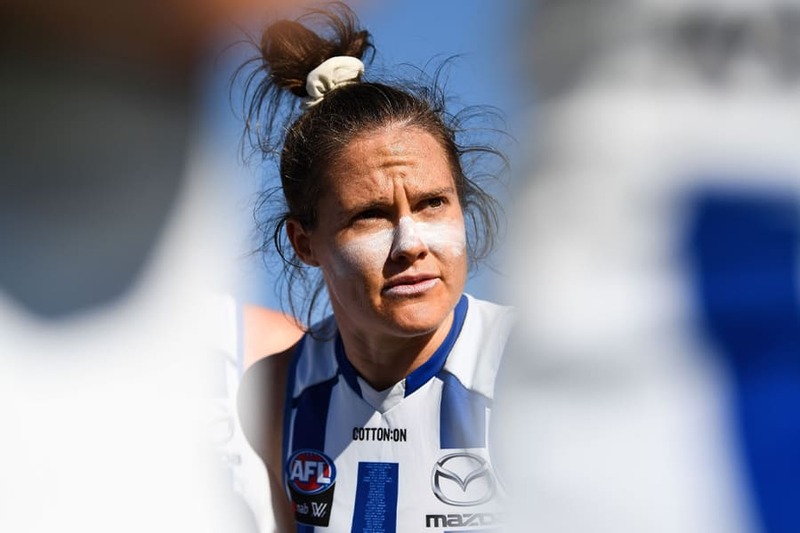 So it’s understandable that the key meanings behind that message now resonate with many of the North Melbourne Tasmanian Kangaroos’ playing group, including skipper Emma Kearney. “I think it’s really important to acknowledge how far we’ve come,” Kearney told North Media. “We didn’t make finals, but if we had a ladder, we’d be sitting in a top four position. Having only lost two games, it was something special to achieve. “We only lost to two teams in Adelaide and Fremantle, who have been in the competition for a few years. They’re probably two teams that haven’t been affected by expansion as well. “Last year at the Bulldogs, they lost two games and ended up winning a premiership. We’re not too far off. As the first ever AFLW player signed to North, Kearney has helped build the culture from day one, something she takes great pride in. “True to North and what we stand for as a club, we recruited really good people,” she explained. “That really helped everyone buy in to what we’re trying to do and it created a really welcoming culture. Hopefully that will keep us in good stead for next year and the year after. “It has allowed us to reflect on how far we’ve come since we first started pre-season and established the list. This includes the relationships that we’ve been able to build and the connections within the club. Despite the disappointment of missing out on finals, Kearney looks forward with optimism, citing the start of the VFLW season with Melbourne Uni. “As leaders we need to instil belief each other,” she said. “When we back in our game plan and what the coaches are trying to do, it will help us in the long run. The common goal of trying to win a premiership will keep us on track. “From there it’s just further developing our list and the players we have, it’s quality. We’ve created a really good environment and the girls feel valued. “It’s about giving the girls more experience, there’s still a lot of girls that haven’t played a lot of footy. That means using the VFLW for particular things. “It will really help with getting used to the game style and our approach to things. It means that we’ll be with the girls for most of the year, rather than just the six-month period.